Buying a huge country home (like a ‘château’ or ‘maison de maître’) and moving to France to start a new life is truly the stuff dreams are made of! Yet most people only dream of it. This inspiring couple has done it! Find out how and get their advice. Gavin and I lived in London for about seven years before moving to France. London was a vibrant place to live, offering entertainment on tap and interesting and challenging job opportunities. There was, however, something missing. The moment we started thinking about starting a family, London’s charm diminished further! By the time our second little one had made his appearance, we were set on moving from London to the South West of France. It seems a crazy leap, but we did our homework and now find ourselves opening our heavy French shutters to views of the Pyrenees Mountains every morning. It is still surreal! So, how did we do it? One of the first things we did was to set-up a subscription to Living France magazine. It offers just the right amount of practical information and inspiring stories. We found ourselves reading a lot of the informative articles and it helped us greatly to get a good understanding of what we would encounter. Next, we placed a large map of France on our kitchen wall. Beside that we hung an office-sized white board. Planning had started in earnest! Every snippet of information was used to help us identify the region that we would then investigate further! It was the South West that won our hearts after considering all angles important to us. We fell in love with the balconies and shutters of Maison Bernis, amongst so much more! Very importantly, we attended the France Show at Earls Court in London. It was here that we learned of a company that specialises in finding French property: French Entrée. We recognised that, with two young children in tow, we needed some help sourcing properties. And wow, what an incredible find French Entrée turned out to be! We could not have done this without them! Nadia Jordan, THE property finder in our area (Gers), looked at over 80 properties on our behalf! We narrowed down the short-list together via emails and Skype. 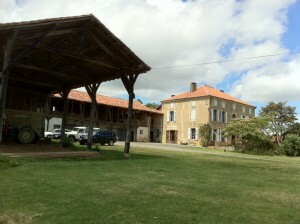 In September 2011, we flew to Toulouse to view the seven properties on our short-list. Remarkably, Maison Bernis was the very first property we visited. I still remember doing a twirl near the open barn and noticing the views of the surrounding mountains and fields. We felt like we had found our home! Maison Bernis is a Maison de Maître. Directly translated, that means ‘House of the Master’ or ’Manor House’. It has five bedrooms and three bathrooms in the main house, all of which was in pretty good shape. It also comes with many outbuildings that all need extensive renovation. We are in the process of doing those renovations now – but that’s a whole other story in itself! Our mortgage advisors (Elena & Rob) of International Private Finance were also instrumental in helping us find the right mortgage. In December 2011, we signed for the property and by September 2012, we had moved in – just in time for the new school year. The whole purchase process was remarkably easy and we couldn’t be happier with our decision to make the move! As soon as the sale of the house is signed, the house is essentially yours and you can start making other plans with the security of knowing the sale of the house isn’t going to fall through (which often happens in the UK). From central London to rural France after four years of planning and the adventure has only just begun! We have been here for nine months now and have been loving every step of learning about life in France – and every step of our renovation projects! Our plan is to welcome holiday guests starting in the summer of 2014. We will be only too excited to share our new home with them – and help them to love this region of France as much as we do! In a few years, we even plan to have our Maison Bernis to the stage that we’ll be ready to host weddings on our property! This is our dream and every day we are living our lives in pursuit of this life that we want. This truly is Wodara for us. It took four years of planning to make this happen – and not every day is easy – but we can honestly say that we are living our dream!